Are you looking for a nice traditional rosemaling piece, but don't want to spend a lot? We are offering this new "ale plate" with a scooped center for that special design. 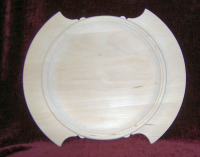 The plate is beautifully turned from basswood and carved. It is 14 inches with a 10 inch scooped center that is encircled with a pretty bead for accent painting. This is a lovely piece!